NEW YORK (CNS) — Some films are so firmly enshrined as classics, and so beloved by moviegoers, that even inviting comparison with them is perilous. Such proves to be the case with “Legends of Oz: Dorothy’s Return” (Clarius). Taken on its own, this animated adventure with music registers as a pleasant, family-friendly outing, though one likely to be forgotten not long after its closing credits roll. But stacked up against Victor Fleming’s evergreen 1939 movie — and small-screen fixture — “The Wizard of Oz,” its inferiority is glaring. Fleming was, of course, working from L. Frank Baum’s 1900 children’s novel, originally titled “The Wonderful Wizard of Oz.” Here, directors Daniel St. Pierre and Will Finn have adapted “Dorothy of Oz,” written 89 years later by Baum’s great-grandson, Roger Stanton Baum. With Oz in the grip of the Wicked Witch of the West’s equally villainous brother, the Jester (voice of Martin Short), Dorothy (voiced by Lea Michele) is called back to the magical land by the companions of her original visit: the Scarecrow (voice of Dan Aykroyd), the Lion (voiced by Jim Belushi) and the Tin Man (voice of Kelsey Grammer). No sooner have they managed to summon her to the rescue, though, than Dorothy’s three friends are taken prisoner by the Jester’s flying-monkey minions. So Dorothy must rely on the help of a new ensemble of pals. 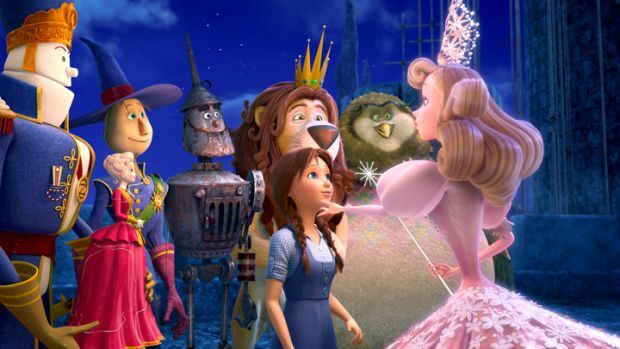 These include a friendly owl named Wiser (voice of Oliver Platt), Marshal Mallow (voiced by Hugh Dancy), a goodhearted military officer from Candy County who is indeed made of marshmallows, and China Princess (voice of Megan Hilty), the diminutive but dedicated sovereign of Dainty China Country. The elegant details of the China Princess’ Dresden-style realm prove to be the highpoint of the movie’s otherwise routine artwork. But St. Pierre and Finn do offer lessons in cooperation, self-confidence and the need to put the interests of others first that parents will be glad to have kids take to heart. They also avoid anything more potentially offensive than the sight of a magical fire hydrant running away from Toto and an instance of childish wordplay. Some sequences, however, beginning with Dorothy’s transmission back to Oz via a sort of rainbow wormhole, may be too menacing for tots. The Catholic News Service classification is A-I — general patronage. The Motion Picture Association of America rating is PG — parental guidance suggested.